Representative: "The administration is declaring war on capitalism"
(CNN) -- A controversy over the way the Obama administration, General Motors and Chrysler decided to shutter more than 3,000 auto dealerships has reached Congress, with a House subcommittee now taking a closer look and a bill under consideration that could reverse the decision. 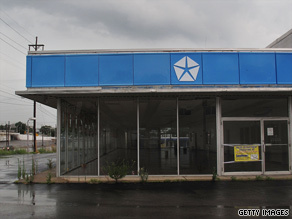 The empty showroom of a closed Chrysler dealership is seen July 12 in Nashville, Tennessee. A House Judiciary subcommittee is holding two days of hearings to scrutinize how and why the dealerships were chosen for closure. Also at issue is the bill, called the Automobile Dealer Economic Rights Restoration Act, which is supported by more than half of all House members, according to several subcommittee members. The bill would essentially overturn dealership closures. Ron Bloom, head of President Obama's Task Force for the Auto Industry, testified on the first day of hearings Tuesday, saying the decision to close the dealerships was critical in getting the two auto companies restructured and streamlined. But subcommittee members said there are many more unanswered questions. "Mr. Bloom tried to assure us, I think, to the best of his knowledge that it was all done on an objective basis. There were point scores, as far as sales and service and performance and customer satisfaction. And that it was all done in a transparent manner," said the chairman of the commercial and administrative law subcommittee, Rep. Steve Cohen, D-Tennessee. Cohen added, "They had a criteria (for closing the dealerships), but I don't know what their criteria was, what the data was ... some were profitable, and there's some concern that there might even be others open in areas where they closed them." Panel member Rep. Lamar Smith, R-Texas, said his concern goes further than that. "Every day I guess I get a little more concerned about what the administration is doing in regard to the GM and Chrysler bankruptcies. It seems to me that literally the administration is declaring war on capitalism," Smith said. Smith said a friend of his in Florida owned three thriving dealerships and was told to close the Chrysler dealership, a $2 million dollar investment, with a three-week notice. "Then the dealership was transferred to his competitor across town, and no one can figure out why one person was being rewarded and another punished," Smith said. The auto bill would mandate that GM and Chrysler reinstate dealer agreements that were thrown out in bankruptcy court, something the Obama administration strongly opposes. The auto companies have said any action like that or the passage of the restoration bill would jeopardize their restructuring efforts -- efforts already approved by a bankruptcy court. New York Democrat Dan Maffei introduced the bill. "We felt it was not fair for these dealers, given that the bankruptcy was negotiated in part by the federal government and with federal money, that the dealers would have to not be able to have their rights," Maffei said. He added, "It's really an issue of fairness and whether these dealers, given that they've got these big taxpayer-paid-for bailouts for GM and Chrysler, whether the dealers who employ 50 people each on average and are big parts of local communities, shouldn't have some sort of say over how these dealer networks are going to be reorganized." For their part, during the process of deciding which dealers to shut down, GM offered its franchises up to $1 million in closing payments. The company also gave them over a year to sell their inventories, if they agreed to the deal. General Motors even reversed the closing decisions on appeal in dozens of cases. Chrysler, though, didn't give out any cash payments and forced dealerships to shut down within three weeks of notification. Chrysler also had no appeal process. General Motors and Chrysler executives and dealers are scheduled to testify at the hearing Wednesday. CNN's Ninette Sosa contributed to this report.